FLIR Systems announces the launch of the FLIR ONE Pro LT, a new lower price thermal imaging attachment for smartphones in the FLIR ONE Pro series. The FLIR ONE Pro LT features many of the professional-level tools and advanced thermal image quality that define the FLIR ONE Pro series. NESF (NextEnergy Solar Fund) is a specialist investment company that invests primarily in operating solar power plants in the UK. It has the authority to invest up to 15% of its Gross Asset Value in operating solar power plants in OECD countries outside the UK. Current UK fuel poverty levels demonstrate that heating our homes can be prohibitively expensive. As ultra-efficient technology has continuously squeezed every watt of saving possible from our lighting, our kitchen appliances, our entertainment and IT systems and even our vacuum cleaners! Safety is always at the forefront of any building design. Whether it’s a new build or renovation, regulations need to be complied with, buildings need to be secure, and occupants kept safe. Sleaford-based electrical contracting firm Butlers is recruiting after winning several new contracts. The firm has been appointed to work on a number of construction projects over the past few months including a housing development in Calverton, Nottinghamshire. Hamilton’s Turnkey electrical wiring solutions does the business! Hamilton Litestat’s Marketing Manager, Gavin Williams, discusses the issues faced by installers when purchasing products for a domestic wiring installation and how this has spurred this UK Manufacturer into broadening its product portfolio to offer a one-stop-shop for installers. Read more about Hamilton’s Turnkey electrical wiring solutions does the business! The events industry has become increasingly reliant on effective power distribution. 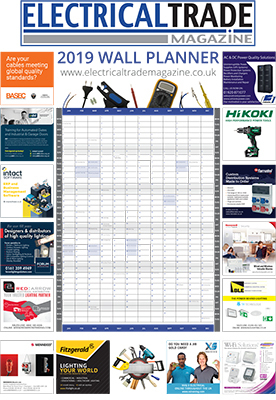 Electrical contractors looking to stay ahead of the competition can now pre-order their copy of the upcoming 18th Edition from NICEIC and ELECSA. C.K tools’ MightyRods PRO to the Rescue! As leading supplier of products to the electrical industry, C.K tools, is very much used producing product solutions for electricians. Read more about C.K tools’ MightyRods PRO to the Rescue!